With the rapid and widespread growth of the yogi lifestyle, it can be overwhelming to sieve through the options of classes available. That’s where Momoyoga comes in – a simple and intuitive management software. Designed for both students and studios, Momoyoga collects all things yogi, and compiles them in one creative, easy-to-use space. Not only does Momoyoga help users find and register for classes that fit their style, but it also works as an aid for studio managers and independent teachers to express their brand and maximize their reach. We sat down with founders Ingo Oszkinat and Joost Gielen to take a closer look at this innovative platform. YOGI TIMES: When was the first moment of ‘Yes! We have something here,’ now let’s go and create it!”? Being a software developer, it didn’t take much of a thought. This process could be organized so much easier – much more efficient, and least of all, error-free. Following up on this topic, I contacted one of my friends (and graphic designer) to talk about it. The idea was: let’s create a small app for my yoga teacher and help her out. Looking for the best approach, we stumbled upon many scheduling apps. We interviewed some of their users (studio owners and teachers in our home city) and found that most of them were relatively unhappy with these apps. We thought ‘Hey, we can make this much better and much easier’. YT: How did you get over the initial hesitation of creating something new? Joost Gielen and Ingo Oszkinat: We were a bit naive back then. Being a software developer and a designer, our thoughts were to start building it and make it happen. I cannot really recall a moment of hesitation. It seemed like a cool project to work on in the evening-hours. Not too complicated and lots to gain, as we found most solutions at the time being far from usable, let alone beautiful. Creating and managing the growth of Momoyoga turned out to be a lot more challenging than we thought. Today we are very proud to see how it matured to where it stands today. Looking back we cannot say we’d just ‘do it again’. It took years of our free-time and blood-sweat-and-tears to get to the point where we are today. YT: Is there one thing you believe Momoyoga can give yogis that you wish you had the opportunity to receive during your learning process? Joost Gielen and Ingo Oszkinat: Good question. Maybe in finding and defining a bigger goal or purpose of your project. We started creating Momoyoga out of nothing, with not much of an idea to build a company around it. Looking back, we could have been better prepared by setting a goal and a purpose. It took us some time and discussion to find answers to questions like ‘what are we doing?’ and ‘why?’. ‘Identity crisis’ is something that you can resolve with not much happening yet, i.e. in a more conceptual stage of creation. We only started asking these questions when we hit the first couple of hundred paying customers. YT: In what ways do you feel Momoyoga can be/ has been an asset to yoga students? Can those who teach independently also experience similar benefits? Joost Gielen: Teachers, studio owners and students can benefit from using Momoyoga. From product perspective our primary focus lies with students. We believe if we can make a carefree solution for students, the studios will benefit as a result. In more detail, the primary functions of Momoyoga are ‘booking classes’ and ‘paying for classes’. These two functions must be so easy in use in that students prefer to book a spot online or via the app. Next there are basics like canceling a class in one click and signing up for a new class on a different date or time. Students prefer organizing this themselves over contacting the teacher directly (i.e. via Messaging). Momoyoga is custom-made software for independent yoga teachers and small to medium-sized yoga studios. We do not necessarily differentiate between yoga studios and independent teachers. Both are served well with Momoyoga. Studios generally use more extensive and in-depth features, such as. recurring payments and per-teacher administration. Independent yoga teachers can simply use Momoyoga for their student and class administration. YT: With the rapid growth of social media and online platforms, what do you believe makes Momoyoga stand out amongst the rest? Joost Gielen and Ingo Oszkinat: We have a natural and strong focus on product. Natural in the sense that we started with the idea of building the easiest software to use around. And a strong focus in that many of our teammates and colleagues have a background in design or software development. Taken these specialisms in mind, we strive to make the most user-friendly software on the market. Our goal is to help yoga teachers and studio owners find balance. Balance between work and personal life, between studio management and time on the mat. We hope to achieve this by creating simple, powerful software, that is easy to use. YT: Prior to focusing solely on Momoyoga, what work have you done in the past, either professional or personal, that has provided you the tools to help it succeed? Joost Gielen and Ingo Oszkinat: Professionally, both of us have been working in the online space for more than a decade. Right out of university we founded and built several companies, including a successful internet agency (that is now run by our friends) and a marketplace for services, that was acquired by a US company in late 2013. On a personal level: having practiced yoga for quite a while, we understood the basic management of a yoga studio before starting this adventure. Many of our friends and family work as yoga teachers or managers at yoga studios. They helped us along the way. We have a feel for design, simplicity and aesthetics, but also the necessary experience in building and scaling a (software) company. YT: With the inevitable chaos that can come with running a company, do you still find time to practice yoga? If so, is there a style or tradition you turn to in order to feel most at peace? Joost Gielen and Ingo Oszkinat: Another great question! Indeed starting, operating and scaling a company is like running a marathon each day. We stand, we fall, we rise and fall again. We do not always manage to stay at peace and maintain balance during the chaos. But we installed at least some things into our offices and daily lives to help us. As of natural, we have yoga mats all around our offices. Everyone is free to take time to meditate, lie down or do some stretches after hours behind the computers. We have no real office-hours. It’s ok to work from home or remotely anywhere on earth. It’s ok to get into ‘the zone’ by using headphones for a couple of hours or going for a walk. We try to make everyone in our studio feel at home. We are a like-minded bunch but different as can be. We believe in multiple communities, interests and differences, which strangely brings unity in the team. When we play music, it can range from heavy Metallica to calming ambient with ethnic instruments. YT: Besides the physical practice of yoga, are there ways in which Momoyoga promotes and encourages the modern yogi lifestyle? Joost Gielen and Ingo Oszkinat: As mentioned earlier, our main goal is to help people find balance. We believe we can make the world a little better by making yoga teachers’ and studio owners’ lives easier. With tools, we enable them to find balance between their personal lives and work. Through yoga teachers and studios, we can reach a broad audience of yogis around the world. May it be teaching yoga classes (we give you more time on the mat) or doing the administration and management of the studio (we save you tremendous hours of time). Bearing this in mind, you could argue that Momoyoga does encourage the modern yogi lifestyle. In today’s world everyone can easily get distracted or feel lost. Just as we are looking to live a balanced life, we hope to contribute to balance in other people’s lives as well. YT: In your opinion, what do you feel is the biggest hurdle for both yoga studios and their managers in terms of reaching their full potential? Joost Gielen and Ingo Oszkinat: We are no studio owners ourselves, therefore we are a bit reluctant to state that these as ‘the hurdles’. But there are a couple of things we hear frequently that we think are worth sharing. Many of these things come down to finding balance. The first thing we hear often is studio owners starting their teaching career out of true love and passion for yoga. Not necessarily because they are interested in starting a business. When finishing teacher training and starting their own studio, they might lose themselves in things that are needed to run a company. This finding is not unique to the yoga community. It is a classic situation in which someone starts to make a profession out of what used to be a ‘pastime activity’. It then turns out later that they do not enjoy the activity as much but rather use it as a means to make money. We find that there is a substantial difference between practicing yoga, teaching classes and managing a studio. A second hurdle lies in the paradox between being a teacher-and-studio-owner and solely managing a yoga studio (without teaching). We’ve heard studio owners purchasing a single goal: to grow the studio. Growth in terms of classes per week, teachers and locations. This does not necessarily mean more income for the studio owner. At least not in the beginning. Let alone maintaining balance with all the management activities that are newly introduced to them. Growing and maintaining a studio generally asks for different skills than teaching a great yoga class. It may be a bit of a taboo, but let’s say that running a yoga studio might not be the most profitable business model in the world, nor is creating software for yoga studios by the way. So, there must be something else that drives us to enter this arena. (We’ve noted our drive earlier in this interview). To conclude on this hurdle, there’s not necessarily a direct relationship between income for the studio (owner) and the size of the studio in terms of the number of teachers or weekly classes. YT: What are your thoughts on yoga professionals using social media as a tool to enhance their brand and reach? Do you think it’s important they embrace this movement? Joost Gielen and Ingo Oszkinat: Social media can be effective for all types of businesses. It is not necessarily tied to size or market. Small business owners (i.e. a yoga studio) can use social media to target a local audience, where corporations might use social media to create and maintain a worldwide brand name (i.e. Nike). We would not go as far as stating the absolute importance of social media for a yoga studio, but it can be a powerful tool to grow your clientele. Word of mouth is mostly spread by offering great yoga classes. As in any market, this is by far the most important thing to do: provide a great product or service and have your clients become your ambassadors. You can use both traditional and new marketing channels to speed up your reach. When you start out, have a few classes attended by happy yogis (ask them first!) and then choose to have more classes per week and grow your studio. There are many ways to utilize the power of social media, simply through pay-per-click advertising in your local area, creating reach through content you may produce, creating attention for special events you are having, and so on. We are happy to go in more detail on this subject, though it might go beyond this interview’s scope. Please do not hesitate to contact us. We love to hear and help! We would also like to point to our recent blog article on using social media mindfully. YT: In what ways does Momoyoga use social media to create engagement among students, teachers and studios? Joost Gielen: Momoyoga does not engage with students directly. We only reach out to teachers and studio owners. Next to providing management software, Momoyoga provides information to teachers and studio owners regarding the ‘business behind yoga studios’, i.e. information on starting and running a yoga studio, being a yoga teacher, and everything that comes with a profession in the world of yoga. This is provided through different channels: our blog (blog.momoyoga.com), our eBooks, and the email newsletter being the most prominent. We use various social media channels to extend the reach of this content. Mainly through Instagram (Stories) and Facebook. YT: Is Momoyoga strictly web-based or is it accessible through other outlets? Which outlets do you feel have been the most effective? Joost Gielen: Momoyoga is web-based. Both teachers, studio owners and students mostly login via our web-based endpoints. Teachers generally use Momoyoga on mobile devices to register student attendance during or after class. For students, we also provide a mobile app, which enables them to easily book classes. As previously said, our primary focus lies with the students. Offline we provide printable views of classes and attendees (for use in the studio) and we facilitate in-studio payments. Most effective and easy-to-use from a teacher/ studio owner perspective is having Momoyoga on a desktop or laptop for more in-depth features and financial administration. YT: How can users best utilize the Momoyoga app? Joost Gielen: For studio owners, it comes down to automating operational tasks and saving tremendous amounts of time. Like automatic payments, registrations, automatic emails, daily scheduled tasks and much more. Teachers mostly use Momoyoga to manage classes and register student attendance. For students the main purpose is booking and paying for classes. Anytime, anywhere and from any device. We picture the student on the couch on a Sunday evening, going through the week agenda. The student can simply open the Momoyoga app, go to the schedule of their favorite yoga studio and book a class within seconds. That’s our definition of ease-of-use. YT: Do you have an idea for the future technological direction of Momoyoga? 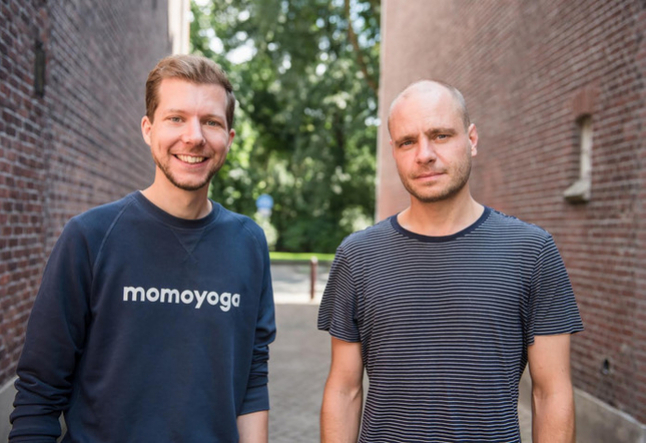 Joost Gielen and Ingo Oszkinat: We have a strong focus on product, so we will continue to improve Momoyoga’s technology and interface with every update, every week. In the long term, we have numerous ideas to better tailor our software to the specific needs of yoga students, teachers and studio owners. We will generally work on ease-of-use (care-free experience), efficiency (time-savers), security and privacy, accessibility (mobile, etc), internationalization and localization. Next, we love to make things beautiful. In the short term, we have a few topics on our road-map: adding features to customize the schedule and registration forms, integration of the registration form into a website, tailoring Momoyoga to specific country ‘settings’ and adding local payment providers and languages. Momoyoga’s development is an iterative cycle. We learn from our users every day and translate these into new ideas, which we build into Momoyoga. YT: With Momoyoga being your ‘baby’ so-to-speak, what are your goals for it moving forward? Joost Gielen and Ingo Oszkinat: Our main goal from a product perspective is to create the best assistant for any yoga studio worldwide. We continuously seek to add value to our users lives (students, teachers and studio owners) by doing what we are good at: creating a simple, beautiful and powerful product. We want to grow our team with bright, lovely characters who passionately want to help the yoga community. Moving Momoyoga forward means continuous improvement, impact and broadening our reach to studio owners and teachers worldwide. YT: What do you hope users take away from Momoyoga? How do you wish to impact them? Joost Gielen and Ingo Oszkinat: We hope to leave a warm feeling with everyone who touches Momoyoga. A great feeling about our team, our product, our brand and the content broadcast through various channels. We believe we can make things powerful by keeping them simple. At a first glance Momoyoga might feel like a ‘simple product’. And that is exactly how we like it to feel. Yet as powerful as the most advanced software around. We believe you should not need any training or manual to use Momoyoga. We hope our users feel that complicated processes can be made easy. Our lives are already complicated enough. Let’s all try to keep things simple, so we have time and energy to enjoy life! YT: Finally, any thoughts on how to make the world a better place? Joost Gielen and Ingo Oszkinat: Our purpose is to help people over the world find balance. Through our software, and its users, we hope to reach as many people as possible. We believe we can make the world a better place by making the lives of yoga teachers and studio owners that much easier. Momoyoga helps yoga teachers and studio owners find balance. We think everyone is entitled to a healthy balance between work and personal life. Between studio management and time on the mat, we want Momoyoga to give you back your time for both personal and professional growth. That is why we create yoga studio management software that is both powerful and easy in use.